K2 is often considered to be the most dangerous mountain in the world. One out of every four people who climb to the summit of the mountain perishes on the descent. So it is no surprise that one of the most terrible mountaineering incidents of all time happened on the mountain. In 2008, the news trickled out of Pakistan slowly. There had been yet another tragedy in the Himalaya that made headlines around the world; and when the dust settled 11 people were dead. The main culprit? A combination of things, but perhaps of most importance, ignoring turn-around times at altitude and the destruction of the fixed lines by serac-fall in a feature known as the Bottleneck. We have previously written about this incident in our review of the excellent book, Buried in the Sky. But now a new film which combines, interviews, footage from the expeditions in 2008, and actors portraying real people has come to video and streaming. 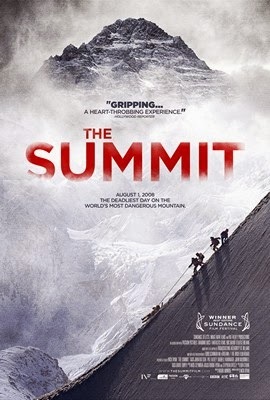 The Summit is a powerful film that will keep you from ever considering an ascent of K2. Nick Ryan's stunning film tells the story of a series of climbing teams who came together on K2 on August 1st of 2008 to make an attempt at the summit. The problem was that there were twenty-five people from several countries with several different types of climbing styles trying to get up the mountain that day. The film is built much like Touching the Void. Ryan uses actors when necessary, emotional interviews and real video to weave together a complex web in order to tell a complicated story. The film is hard to watch. It's a true story with real footage of people on a mountain. And many of those you're watching are gone, their bodies still up on the mountain. Perhaps the greatest flaw in the film is that the story of what happened that day on K2 is complex. It's so complex that you leave the film without a complete understanding of what happened in the tragedy. None of the people who lived it tell the same story. As such, there is no unified version where armchair mountaineers can sit back and say, "that's where it all went wrong."